IAPL condemns the threat issued by Shivaji Pawar, ACP, Maharashtra Police to arrest IAPL’s President Justice Hosbet Suresh (Retd.) and the most alarming portrayal by him of IAPL as a frontal organization of CPI (Maoist). IAPL believes that such attacks on Judges and Human Right defenders which includes lawyers and organizations, require to be understood in the in the light of rising authoritarianism and fascist attacks in the country. It is the need of the hour for all organisations and individuals to come together and resist this onslaught collectively and to strongly condemn and resist this brazen attempt to intimidate Justice H. Suresh (Retd) and members of IAPL. 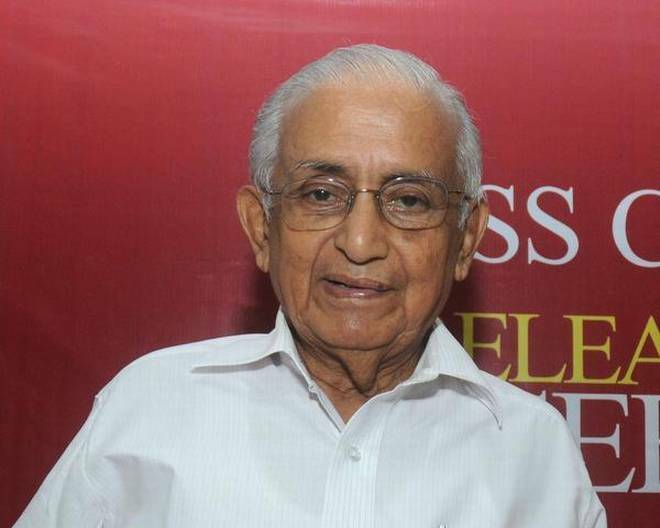 Justice H. Suresh, now in his late 80s, is a former judge of the Hon’ble Bombay High Court and is leading figure in Human Rights activism in India. After his brief but glorious judicial service, he led a number of Commissions of Inquiry that investigated violations of human rights. Justice Suresh investigated the Kaveri Riots (1991) in Bangalore, post-Babri Bombay riots (1992/1993) publishing their findings in a 1993 report titled ‘The People’s Verdict’. In August 1995, Justice Suresh issued “Forced Evictions – An Indian People’s Tribunal Enquiry into the Brutal Demolitions of Pavement and Slum Dwellers’ Homes”, a report documenting the use of brutal and indiscriminate force against slum dwellers in Mumbai. In 2000, joined by former Supreme Court judge Justice V. R. Krishna Iyer, Justice Suresh held a two-day hearing into the slum clearances in which about 60,000 people had been evicted. The Inquiry covered both legal aspects of the clearances and the human impact. Justice Suresh along with Justice P.B. Sawant, were members of Indian People’s Tribunal (IPT) fact-finding team headed by Justice V. R. Krishna Iyer that went to in March/ April 2002 following the communal riots triggered by the Godhra train attack. The tribunal gathered 2,094 oral and written testimonies and met with many senior police officers and government officials. Findings were documented in their report “Crime Against Humanity”. The fact finding team visited the former state Home Minister Haren Pandya who informed the fact finding team on recorded audio tape, with request of anonymity, that then Chief Minister Narendra Modi had told the police not to restrain the rioting Hindus. Pandya was thereafter murdered in 2003. In reaction to the mass killings in Gujarat, Justice Suresh was one of the drafters of a proposed law “The Prevention of Genocide and Crimes against Humanity Act 2004”, in light of Convention on the Prevention and Punishment of the Crime of Genocide, 1948 to which India is signatory. This would make Ministers and officials criminally responsible if they failed to exercise control in cases of mass violence against a group of citizens. In his 60 years of public life, Justice Suresh has always been vocal against draconian laws, state repression and judicial corruption. IAPL strongly condemns this brazen attack on Justice H. Suresh which is not just an attack on an individual or an organisation but is a conspiracy to silence every Judicial officer who hold the Constitution and the obligations that fall on such obligations therein as paramount to their lives. Furthermore, this is a direct attack on the entire paradigm of the separation of the judiciary, a basic structure of the Constitution and our democracy. This attack on Justice H. Suresh is not an isolated incident of persecution and attack on judges who refuse to become executive puppets. The mysterious events leading to the death of Justice Loya gives us all sufficient cause to apprehend a further persecution of Justice H. Suresh. Furthermore, such statements are not only in a continuum of a conspiracy of vilification and intimidation but are deeply defamatory and serve to de-legitimize the invaluable legacy of Justice H. Suresh. It has also come to our attention through various media reports (Times of India, Pune Mirror, Business Standard among others) that the State of Maharashtra while opposing the bail applications of IAPL’s Office Bearers Advocate Surendra Gadling (General Secretary), Advocate Sudha Bharadwaj (Vice -President) and Advocate Arun Ferreira (Treasurer), argued that IAPL is a frontal organization of the banned CPI (Maoist) Party. Senior Advocates Sudeep Pasbola and Yug Mohit Chaudhry representing Arun Ferreira and Sudha Bharadwaj respectively argued that IAPL’s lawyer-members are carrying out the constitutional obligation of legally holding the State accountable for excesses amounting to violations of human rights of the citizens of this country. It is pertinent to note that such allegations on IAPL have not been made by the State prior to this hearing, either in the Romila Thapar’s et al petition before the Supreme Court or anywhere else. IAPL outrightly rejects and strongly objects to such allegations levelled by the State of Maharashtra and supports the Office Bearers of IAPL. Further, IAPL condemns the attack on people’s lawyer organisation and such brazen efforts to portray it as a frontal organization of CPI (Maoist). At the outset, it is explicitly clarified that IAPL is an independent organization and is the Indian Chapter of the International Association of People’s Lawyer and has no direct or indirect affiliation to any political party. If IAPL has been at the front of anything it is in representing all democratic struggles in and outside the courts, providing defence to the marginalised, and speaking up against persecution of lawyers in India or elsewhere. These claims made by the State of Maharashtra are an attempt to silence rights lawyers, activists and organisations involved in human rights work and to create a hostile working environment for all such lawyers directly infringing on their fundamental rights to practice their profession. IAPL takes this opportunity to clarify that it is a member an international organisation called International Association of People’s Lawyer founded in 2004 to bring together lawyers involved in the legal support of collective struggles for peoples’ rights and in situations of gross rights violations on a collective platform. The international organisation has recently released a report which brings to light that globally we are living in a scenario where in many countries of the world, it is dangerous to be a lawyer. This is especially true if the lawyer is attempting to protect the rights of the people against corporate or government interests or is exposing corruption. In a similar vein, IAPL and its members are presently being targeted and arrested for working towards the protection and furtherance of the constitutional and human rights of the people. It is a lawyers organisation and all members are human rights workers and rights advocate working for the preserving of the rights of the marginalised. IAPL’s work is within and in furtherance to the four corners of the Constitution of India and is built towards ensuring the protection of fundamental human rights of all citizens of this country. Given the current political ecology of the country which is structured on the fascist ideology of silencing dissent and perpetrating violence rather than protecting the most marginalised and vulnerable the rights advocacy work of IAPL and the human rights work of all its members has most unjustly resulted in IAPL being categorised as the frontal organisation of the CPI (Maoist). It is ironic that the lawyer-members of IAPL and the organisation in itself are both being wrongfully imprisoned and persecuted for the very same crimes that they have in the recent few years exposed and brought to light. CONDEMNS THE PERSECUTION AND VICTIMIZATION OF JUSTICE H. SURESH AND IAPL AND STAND IN SOLIDARITY WITH JUSTICE H. SURESH AND IAPL AND FURTHERMORE COLLECTIVELY RESIST AND EXPOSE THE FASCIST TENDENCIES IN THE COUNTRY. DEMAND AN END TO THE PERSECUTION OF MEMBERS OF INDIAN ASSOCIATION OF PEOPLE’S LAWYERS. The Indian Association of People’s Lawyers (IAPL) was founded in 2004 with advocate P.A. Sebastian of the Bombay High Court being its President. The founding conference of IAPL, held in Mumbai in 2004 was attended by approximately 70 lawyers. The second and third All India Conferences were both held in Nagpur on March 25th and 26th, 2006 and January 8th and 9th, 2011 respectively. Justice (Retd) H. Suresh, Justice (Retd) Michael Saldanha, Justice (Retd) Rajinder Sachar, Advocate P. A. Sebastian, Advocate Dr. Mukul Sinha, Advocate Indira Jaising and Advocate Prashant Bhushan were some of the prominent speakers who actively participated in the Conferences. At present Justice Hosbet Suresh (Retd), Hon’ble Bombay High Court is the president of IAPL. He is a well-known human rights activist himself. Known human rights lawyers, Sr. Advocate Bojja Tharakam and Adv. Shahid Azmi have been members and office bearers of IAPL in the past. Senior Advocate K.G. Kannabiran and Adv. K. Balagopal was also closely associated with the organisation. The work of these lawyers on issues of civil liberties and human rights is well-known and documented and has served to inspire several young legal minds in the country and abroad. IAPL is a constituent of the International of People’s Lawyers. International Association of People’s Lawyers has its headquarters in the Netherlands. Its founding Congress was conducted in the year 2000 in Doorn, Netherlands, which was attended by lawyer-members from Belgium, Netherlands, Germany, Mexico, Colombia, Nepal, Turkey, Philippines, India and a few other countries. International Association of People’s Lawyers has noted an alarming pattern worldwide that when regimes grow increasingly ruthless, and peoples’ struggles are repressed lives and liberties of lawyers and human rights defenders are directly affected rendering them extremely vulnerable. To address this concern, an IAPL Monitoring Committee on ‘Attacks on Lawyers’ was created to study, document and denounce attacks worldwide and offer contributions to restore and provide justice for such violations. In India IAPL was thus formed inter alia with the purpose of advocating a critical stand against Indian and International legal systems that perpetuate an unfair socio-economic order and frustrate the legitimate aspirations of the people for national liberation, social justice, democratic rights and civil liberties. IAPL has lawyers, law students and paralegals as members, each of them believe in and work towards creation of a just and egalitarian society and provide legal support to people’s struggles in pursuance to a life with human dignity. Apart from issues of international relevance, IAPL takes up issues that are particularly important to India, including issues regarding marginalised people, whether peasants, workers, indigenous people, women, minority groups and Dalits. Their mode of operation is such that they approach organizations or individuals, enquire about their legal problems and handle their cases both inside and outside courts, as circumstances may demand. IAPL does not receive any finances from funding agencies. It is only through members’ and the contributions of well-wishers that activities are conducted. The recently retired Chief Justice of India Hon’ble Dipak Misra, in August 2018 while delivering the first Madhusudan Das Memorial Lecture at his alma mater, Madhusudan Law College, on the topic of ‘Role of Lawyers in the Dispensation of Justice Delivery System’, said that: “lawyers as a class are supposed to do service to society like that of the judiciary as an institution and protect human values”. He called upon law students to engage in the practice of ‘cause lawyering’ and develop the idea of serviceability to law by taking up pro bono cases to protect human rights and rights of individuals. It is precisely this cause lawyering that IAPL and its lawyer-members have been consistently doing since its formation. IAPL’s work has persistently exposed state excesses in so called “conflict zones”. IAPL’s work is extremely important and it has spread over a range of issues, work which has painstakingly, diligently and persistently exposed state’s excesses in specifically targeting lawyers that provide support to the defenceless and the marginalised. Time and again, IAPL and its work have received solidarity and appreciation messages from its foreign counterparts in Australia, France, Philippines and Egypt. Its work has demanded the state and its machineries to adhere to the constitutional principles and ensure that fundamental rights are guaranteed to each and every citizen of this country, most importantly the right to a fair trial, right to life, and right to move freely throughout the territory of India, each contributing to the grundnorm of the Indian democracy. Over the years its formation IAPL has participated in many fact finding reports and issued press release statements which have highlighted persecution, intimidation and harassment of lawyers, including Adv. Rajat Kalsan, Adv. Upendra Nayak, Adv. S. Vanchinathan, Adv. Mian Qayoom, Sr. Adv. Indira Jaising, Adv. Chandrashekhar Ravan, Adv. Deepika Singh Rajawat, Adv. Murugan, Sr. Adv. Dushyant Dave, Adv. Mohammed Shoaib, TN lawyers struck from rolls etc. ; scrutinised recent amendments to the Advocates Act, 1961 and took nation-wide campaign against the amendments; appealed on behalf of persecuted lawyers in Egypt, China, Turkey and Philippines; conducted seminars on judicial accountability; most crucially produced a detailed fact finding report on attacks on lawyers in Chhattisgarh; and highlighted persecution of lawyers in Kashmir, amongst other activities. All the activities of the organization have been public, documented and were well-reported by the press. Through all of their fact finding reports, IAPL has been active in highlighting state impunity in many cases, where draconian legislations like Unlawful Activities (Prevention) Act, National Security Act, Public Safety Act, CSPSA have been utilised to criminalise and persecute advocates representing clients. They have brought to light the extreme harassment and intimidation of human rights defenders in areas of Chhattisgarh. In their fact finding report released in January, 2017 they exposed the attacks on lawyers in Chhattisgarh. They examined the reality of the state’s socio-economic conditions by analysing the contrast between claimed investments and human development index of the state and its people. As is clear through several scholastic works, media reports, and judicial precedents, the state has been on an offensive labelling each protestor in Chhattisgarh a Maoist, with a hidden agenda of clearing the region for mining and furthering other corporate agendas thereby justifying the massacre and arrests of the adivasis residing in the area, all in the name of national security. Through this fact finding report, IAPL highlighted that lawyers defending their clients and providing valuable legal aid are being persecuted and threatened under draconian laws, and are being identified are with their clients cause. They stressed on the fact that the Bar Associations instead of safeguarding the interests of lawyers, and creating an atmosphere where they are able to function freely without fear are harassing these lawyers further by passing resolutions and barring lawyers from representing Christians, Dalits and alleged Maoists, and intimidating those who dare to so appear. IAPL’s fourth and the most recent All India Conference was held in June 2017 also known as the “Emergency day”. It was held in the backdrop of the recommendations of the Law Commission to criminalize lawyer’s strikes for abstention from court work. It was strongly felt that in light of the increasingly alarming turn that the political situation in the country was taking, a discussion around the emergence of an emergency like situation in the country was urgently required: “The right to strike flows from the fundamental right to association and protest. It was the contention of IAPL and its members that like most of the oppressed sections in India, the right to protest and collectively bargain is being criminalized and gradually eroded. Draconian legislations such as the Unlawful Activities (Prevention) Act, Sedition, Armed Forces Special Powers Act and various Public Security Acts are being used to suppress the struggling people and dissenting voices. Thousands of such people’s activists, lawyers or Human Right Defenders have been labelled as ‘terrorists’ or ‘anti-Nationals’ and incarcerated under such Acts. On the other hand State Surveillance has been steadily increasing. In the name of ‘National security’, the citizen’s right to privacy is being systematically curtailed. The blatant example is the UID (Aadhaar) project which forces the citizen into choicelessness, destroying the idea of consent, while the State assumes power over the body and data of every person, for corporate interest to exploit. All signs of a new Emergency”. The two-day National Conference was attended by more than 150 delegates from different states at the end of which a collective program was formulated for the future. A new Secretariat and All India Executive to lead the Association and Justice (Retd) H. Suresh as President were elected. On the second day, the gathering was addressed by Justice (Retd) Abhay Thipsay on the issue of “Independence of the Judiciary and the Bar” followed with inputs by: Dr. Usha Ramanathan on “UID, Surveillance and the New Emergency?”; Adv. Parvez Imroz, (President, JKCCS) on “Situation of Lawyers in Kashmir”; Justice (Retd) H. Suresh on “the need for People’s Lawyering”; Adv. Rajvinder Singh Bains on “Civil Liberties and the Judiciary” and Prof. Srikrishna Deva Rao (VC, NLU Odisha), on “Social Movements and the Judiciary”. A. Lawyers in Kashmir are working in very difficult circumstances while trying to bring some semblance of the Rule of Law. We were shocked to find that apart from facing threats, intimidation, illegal detentions and arrests, many have been subject to torture and killings, while discharging their professional responsibilities. B. The Lawyers are exhausting all local remedies available to them in fighting this uphill battle and face little or no success. This is partly due to the interference by executive, police, administration, and armed forces in independent functioning of the judiciary, and also partly due to deliberate non-compliance of judicial orders. C. The extra-ordinary laws in force in J&K give immunity to perpetrators leading to a culture of Impunity, resulting in the collapse of the justice delivery system to victims of Human Rights violations. The circumstances and these preliminary findings of IAPL are crucial to note and emphasise because immediately on the heels of this press release, Advocate Surendra Gadling (General Secretary of IAPL) who was one of the members of the fact finding team in Kashmir, was intimidated by the Maharashtra police and then arrested on June 6 in country wide police raids. On August 28th Sudha Bharadwaj (Vice President of IAPL) and Arun Ferreira (Treasurer of IAPL) were also arrested in a country wide raid. SUDHA BHARADWAJ is a human rights lawyer and a trade union activist who has tirelessly worked all her life to support people of Chhattisgarh. She has spent a lifetime dealing with the law and using it to defend and help those who need it the most. During the time of her arrest she was a visiting professor of National Law University, Delhi. Since her arrest and subsequent house arrest, many members of the public have come out in her support highlighting her lifelong work among the people. Bharadwaj, is the General Secretary of the Chhattisgarh People’s Union for Civil Liberties (PUCL), , is the founder of Janhit (a collective of lawyers providing legal aid to human rights and civil rights groups in Chhattisgarh) and is also associated with the late Shankar Guha Niyogi’s Chhattisgarh Mukti Morcha, a labour union in North Chhattisgarh. It should be noted that ever since the vilification campaign against her started, Labour Camp Jamul, in Bhilai where Bharadwaj is a permanent resident of, has been daily, erupting into protests. SURENDRA GADLING is a Dalit lawyer who began his career, almost two decades ago in Nagpur, fighting cases for those arrested under the draconian Terrorist and Disruptive Activities (Prevention) Act 1985, and the Unlawful Activities Prevention Act. He also worked as a special public prosecutor on dowry-related cases and was one of the leading lawyers in connection with the Khairlanji agitation – a protest movement launched after the gruesome caste-murders of a Dalit family in Maharashtra. Surendra Gadling has been one of the most reputed lawyers in the country. Post his arrest in June, the Nagpur Bar Association passed a resolution in solidarity and condemning his arrest. ARUN FERREIRA is a writer, cartoonist, activist and a human rights lawyer who earned his law degree while in prison. He fought a relentless legal battle to prove that the charges levied against him were false and completely fabricated. He was acquitted of all charges in 2014. He has seen, written and publically spoken about the abuse of law, prison conditions, and human rights violations on various occasions. Before his arrest and after his release, he was and remains an activist and defender of rights. Since his release he set up his own legal practice. It is pertinent to note that Arun Ferriera alongwith Vernon Gonsalves (another one of the arrestees in August 28th raids) had written most critically of the State agenda behind the June 6th arrests of Surendra Gadling alongwith four other human rights activists and scholars and had laid bare the malicious prosecution on account of which he has been at the end of persecution.